When I posted this behind-the-scenes iPhone pic yesterday on FB and Twitter, and mentioned I was using Lightroom Mobile (that it running on my iPad), I had lots of questions of how and why we used so I thought I’d tackle that here today on the blog. First, I know there are lots of apps (OK, at least a few) that will let you transfer your images from your camera over into your iPad so you can see them during a shoot. In fact, Terry White had a great article on shooting straight from an Eye-fi Wireless SD card, through an App, right over to your iPad (here’s the link), but I wanted more than just being able to see them. I want this to be a part of my workflow to make my job easier and faster so I thought Lightroom Mobile might do the trick. Above: Here’s a test shot I took the night before seen here in Lightroom Mobile. You can see the Develop Module Basic Panel adjustments shown here, like White Balance presets; Temp and Tint, Auto Tone, Exposure (you swipe to the left to see all the rest). (1) I was tethered directly into Lightroom during the entire shoot, and I could have the images I tagged on my Laptop in Lightroom transfer wirelessly to my iPad, which worked great. But that part’s a given. (2) Because the images were now on my iPad, I can hand this iPad to anyone on the set. The Art Director can have this right in her hands, and when she sees a shot she likes, just can flag it as a Pick and her choices are sent right back over to me in Lightroom on my Laptop. That is slick! Also, she can be looking at different images than I’m seeing on my screen, so I don’t get in the way of what she’s looking at on the iPad, and vice versa. (3) I can edit those images right on my iPad, even when I shooting in Raw! If we’re looking at a shot and the Art Director (or client, or MUA, etc.) notices a light stand in the shot and says “Can your crop that out?” I can crop it right there on my iPad while they watch. I can brighten it, darken it, add Clarity, open up the shadows, apply Presets — all the same things I’d do in Lightroom in the Basic Panel are all right there for me in for real time, and those changes are sent right back to Lightroom without me having to do anything. (4) Any changes I make to an image once it comes into Lightroom on my Laptop (cropping, brightness, Vibrance, all that stuff and more) â” those get sent directly over to the person holding my iPad so they see my changes right after I make them. Sweet! (5) I don’t have to pay anything extra for any of this â” I don’t have to buy special wireless SD cards, and I don’t have to use a camera that uses SD cards (some of my camera’s can’t use SD cards), and I don’t even have to buy an App. Lightroom Mobile is part of the $9.99-a-month Photoshop and Lightroom Creative Cloud bundle deal from Adobe. If you have the full Creative Cloud subscription instead (I do), you still get Lightroom Mobile, so either way you’re covered. (6) Lightroom Mobile is on my iPhone, too. Those are the reasons I wanted to try-out Lightroom Mobile at the shoot, and I was tickled with the results. I’ll be using on set from here on out (plus, it has a lot of “cool factor” — it’s pretty slick to hand someone an iPad and there are the images they just saw being made). Above: Here’s one of my own Behind-the-Scenes shot, seen in Lightroom Mobile’s Basic Panel layout (see the controls along the bottom?). Weird but true: This was actually taken with a real-life DSLR (instead of an iPhone) â” I just zoomed out wide to catch this BTS view. That’s Adam on the left, our Steadicam operator and genius video guy with Kristina, our awesome New York City-based model, whose eyes are closed so I can only imagine that Adam has bored her into a sleep state. Be that as it may, I have to say, I’ve never seen Adam look more radiant. Or was it resplendent? I saw a couple of comments asking about this, and of course (I hope this goes without saying), but iPads and iPhone don’t have a color management system. Well, they may have one, but you can’t touch it or adjust it or match it to anything. I’m totally 100% fine with this, because like pretty much everybody these days, about 99.5% of my images are going to be posted on the Web â” in my portfolio, or here on the blog, or on Facebook, or G+ or Twitter. Which means my images will look different on every single person’s computer on earth. Want to test this one? Go to BestBuy and stand in the monitor department and watch the self-running demos that appear across the screens. The color is different on every single monitor and these are brand spankin’ new monitors! Same thing with TVs. Above: We set up a two-monitor workstation on the set so I could proof, and approve clips for a behind-the-scenes video, while the model was in make-up for the next look. Even those two monitors, from the same manufacturer, don’t exactly match color-managment wise. We created a FREE Lightroom Mobile Learning Center with lots of videos that literally take you through the entire App and teach you exactly how it works. Here’s the link. 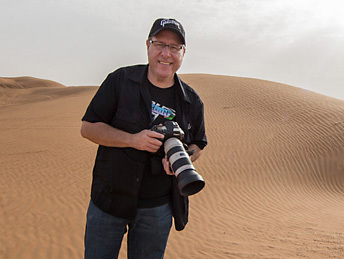 If you’re a KelbyOne subscriber, we have a similar online class there. Of course, since we did that, Adobe just came out with some nice improvements and enhancements to Lightroom Mobile, so if you want to hear about those, just watch the video below from our own Matt Kloskowski, who by the way is on vacation in Hawaii, so I’m not in the mood to give him much more love than that, strictly due to extreme jealously. There. I said it. So, that’s it. I’m not an expert at Lightroom Mobile (yet), so hopefully I’ll uncover some new things the more I use it (and I’m happy to share anything I learn along the way), but for now, I’m just super digging’ it. Ya know what else I’m super digging? The fact that it’s Friday. I’ve had a super-mega busy week, that started with a trip to Canon’s HQ up in New York City, and ended with a majorly delayed flight. I had The Grid the following day; I had a spate of non-stop back-to-back meetings at the office, I had a mini-shoot Wednesday night; I had a major shoot yesterday, and now my friends, it’s Miller Time. Well, it’s actually still morning, so it’s not exactly Miller Time but you know what I mean. Here’s wishing you all a relaxing, fun-filled, helium-filled weekend! Do you know if you can use multiple iPads at the same time in the same session? Do you think it would work on an iPad Mini or would that be too small? Yes, you can use multiple iPads. But only when you view pictures within their app. So it wouldn’t help with any other app. Cool stuff! Can’t wait to see the final shots. Sounds like a less well integrated, less elegant version of Capture Pilot for Phase One’s Capture One app. Awesome blog post Scott …. thanks! I plan to use LR and LR Mobile on my shoot this weekend! Can’t wait. Shooting tethered and now with the ultra-mobility of the iPad/LRm will make the process of working with my model and team so much easier — not to mention more FUN (“cool factor”) ;-) . I culled and edited about 180 photos yesterday using LR Mobile and I loved it. Particularly useful, for me, was the Previous function. I used it to apply the same look to multiple photos taken at the same time. While not as fast as AutoSync on the desktop version, it worked great. I also found flagging my picks and rejects a lot easier on the iPad. Just swipe up or down. I may not be thinking this through but the only way I could think of linking the tether to my Iphone was creating a smart collection. But, I can’t seem to link a smart collection to the Iphone. How were you able to link it? You create a collection, then in the pop up window you check the box to sync to the mobile. It does it all through the cloud. I understand how to sync a collection to my Iphone. But how does the photo, as I take it, get transferred to the collection from the folder that I am shooting to.I can’t figure out how to set that with a collection. It will with a smart collection but you can’t sync a smart collection to the Iphone. My question too! Aside from drag and drop photos from “All Photos” how do you get them into a LR Mobile snyc’ed collection? Since you can’t sync a smart collection how did you get the images into the collection that syncs with Lightroom Mobile. How long did it take from the time you took the picture to the time it showed up on the iPad? I don’t think he or any of them sleep. This looks too advanced for my little brain. Great article! I believe Xrite has a app called ColorTRUE that allows you to colour manage iPhones and iPads. I don’t have an iPad so can’t vouch that it works on the iPad. I did try it on my iPhone but the screen is pretty small so it’s hard to tell if it made any changes. i hadn’t even tried tethering yet. I used it for culling and editing and it works great for that. Thanks for this post. While you are having your Miller, or whatever adult beverage, you can review your photos on your iPad/iPhone. I’m loving how technology just keeps making things easier! Of course, those of us who use Android are left out in the cold. Oh, wait, Android is only 70 percent of the market and it’s no way as cool as anything Apple does. Is this the end of shooting tethered to a laptop? Anything (useful) that you can do when using full Lightroom on a laptop versus Lightroom Mobile on iPad that warrants laptop use rather than iPad? i guess i missed the “how-to” do this in the blog. I watched the kelby video, matt’s video, and saw nothing on how to sync the tethering capture to a collection so you can view it on the ipad at the same time. I created a collection in which to sync to LR mobile, which works fine. However, the only way to get photos I just shot to the collection from the Tether capture is to move them manually or set the collection to the target collection and hit “B”. Lightroom is also running on this computer and the Lightroom Extension Folder Watch watches the folder (in our example C:newfotos) including subfolders and puts the photos automatically to a collection that syncs with Lightroom Mobile. So after a short moment I have each photo in my Lightroom Catalog and also on my iPad/iPhone. Hi Scott! I downloaded LR Mobile to my iPad. I get the message: No collections available. Enable sync in Lightroom desktop to get started. I’m using Lightroom 4 ver. 4.4 camera raw 7.4 I looked through all the headings and preferences and could not find the sync setting to turn on. I checked for updates. the message is that Lightroom is up to date. Can you tell me how to turn on the sync setting. Scott, Need your help. I can’t figure out how you synced the collection to Lightroom Mobile while you were tether shooting. How does it get from the folder you are shooting to….to the collection without using a smart collection. Other than doing it manually I can’t think of a way. I assume you didn’t run to the computer every time you shot an image and hit the letter “B” to send it to the collection. You help is appreciated. How do you keep you catalogs synchronized across multiple computers while also using Lightroom Mobile to sync with a tablet? I’ve noticed that copying my Catalog from one computer to another, or from an external to internal drive, prompts Lightroom to want to reconnect and re-sync photos with Lightroom Mobile. Before Lightroom Mobile, the advice I read was to keep the Lightroom Catalog and supporting files in a cloud-synchronized folder (ie. with DropBox, Google Drive, SkyDrive, etc).